When Queen Victoria donned a white satin dress for her 1840 wedding, it was viewed with some surprise. 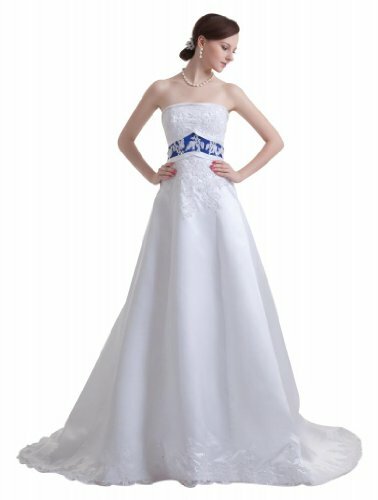 Wedding dresses could be any color, but white was neither fashionable nor common. In truth, she'd picked it because she had a lovely 'deep flounce of Honiton lace' that she wanted to show off. That was white, so her dress was white; thus she sparked a 'custom' in fundamentally imitation brides, which has so far lasted nearly two centuries. Royal wedding columnists had to find something to say about Victoria's white dress, and 'it matches her lace' wasn't going to cut it. 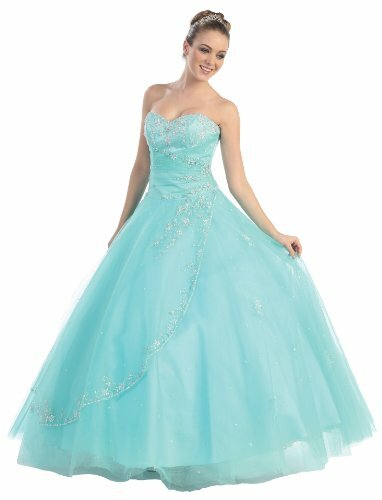 Without much in the way of meaning at all, they nicked the symbolic attributes of a truly ancient wedding dress color - blue. Thus pulling off a sleight of hand about 'purity' and 'piety' still erroneously repeated today. Break free of Victorian misinformation! Return to your roots, wear an age-old hue that even your pre-19th century forebears would recognize as customary. 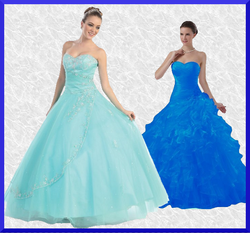 Buy a blue wedding dress for your traditional walk down the aisle. This is now a proverb, derived from a longer verse. 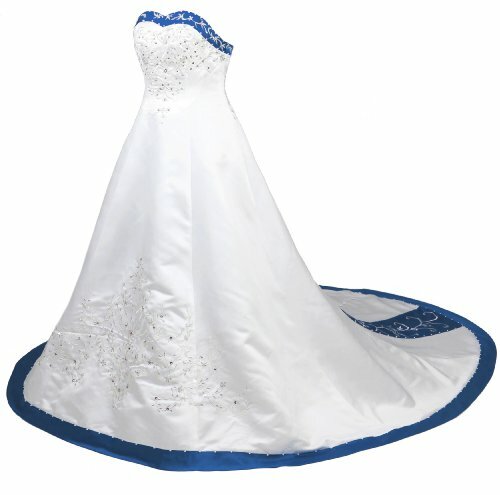 Marry In... is a traditional wedding day rhyme that harks back to the custom of blue bridal wear. In other words, you can get away with white (which makes me think this rhyme dates from after 1840) or blue. That's it. 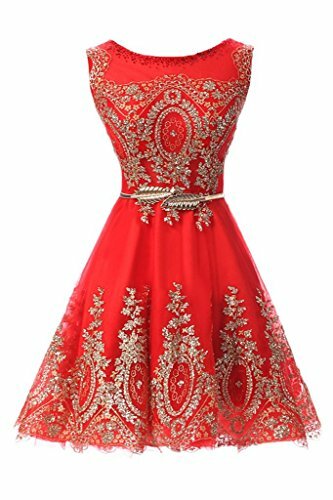 For those not paying attention to the folkloric advice, then Marry in... also demonstrates the breadth of bridal wear color choices back when this was composed. The fact that it's survived to be repeated even today tells us that people didn't think marrying in any of those colors was particularly strange, if ill-advised! Marry in pearl, you'll live in a whirl. Blue as the color of fidelity and loyalty also crops up in the American saying True Blue, though that may yet date from 17th century Scotland. So why is the color blue so linked with truth and especially so in weddings? The answer to that lies in the Madonna. Sorry! I couldn't resist it! *giggle* Madonna's 1986 song (and album) isn't quite the origin of blue with constancy. That was the OTHER Madonna. There's plenty more to come if you haven't spotted The Dress yet! 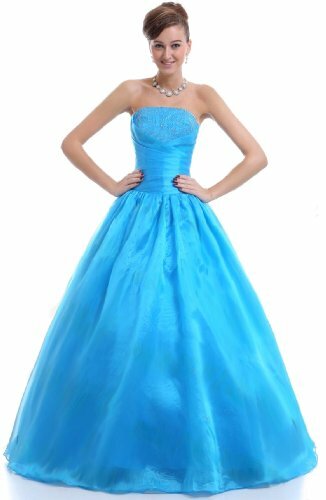 Why a Blue Gown for a Wedding? 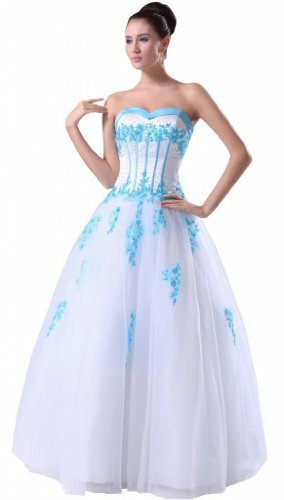 All those words generally associated with white dresses properly belong to blue. Our ancestors were more concerned with propriety than amusing Queen Victoria. There's a reason why the Virgin Mary tends to be depicted as a woman dressed in blue. Part of that clue is in Her name. It didn't quite begin like that. 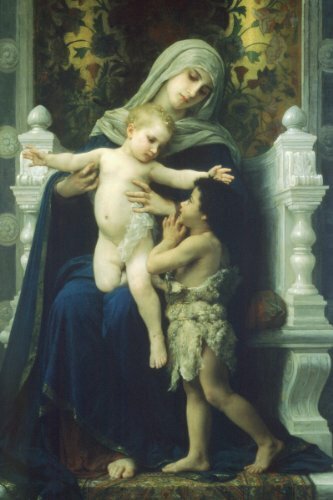 Back when the color blue was first associated with the Holy Mother of God, it was the color of royalty. This was 500 CE, where cobalt blue was the most expensive dye available to Byzantine society, hence it was worn by the Empress to show off her wealth. By dressing the Queen of Heaven in blue, a point was being made about Her status. She was the most important female in the room. But dyes get cheaper (though not by that much for cobalt blue), hence that particular point was lost on the later Christian multitudes. Instead they looked for meaning conveyed by Mother Mary Herself onto the hue. Depending upon who you talk to, and at which moment in history, the color blue gathered many different attributes, all loaned from the view of Mother Mary held in each era. It was Her hue, therefore blue held a symbolism as rich and varied as Her reach. The Madonna/Our Lady/Domina used blue to indicate Her high station in life. The Queen of Heaven wore blue to match the color of the skies. Blue became the artistic hue of holiness, implying a glimpse into Paradise, signifying divinity. Stella Maris - Our Lady of the Sea - chose blue because it was an oceanic color. Our Lady of Sorrows presents a gown the flooded hue of tears. 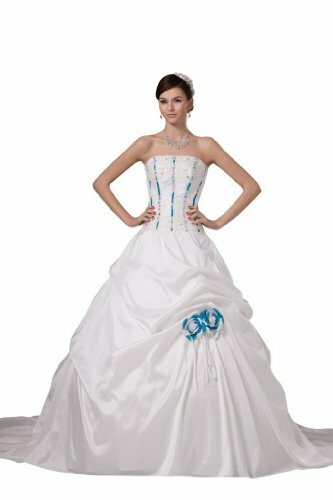 But all of this dates from before anyone thought that wedding dresses should be a certain color. As late as the mid-20th century, brides tied the knot in whatever color they liked - or more usually, whatever happened to be the hue of the best dress that they could beg, borrow, steal or buy. If the latter, then black was quite a favorite, because new gowns were way too expensive to put away after the big day. Wedding dresses instantly became everyday dresses after the confetti was thrown, and black didn't show up the dirt so much during housework. It was only really the rich brides copying Queen Victoria. The sort of people who didn't have to worry that white had quite opposite properties when worn in the grime. 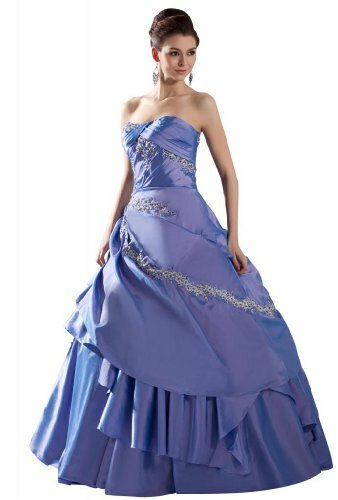 Western culture might not have had a 'traditional wedding dress color', but the most commonly worn bridal gown hue was blue. It was nothing to do with marriage rites, beyond a tenuous nod towards matrimony (blue = Mary; matrimony, from the same root as matriarch = now legally allowed to have kids). Blue spoke volumes about the bride. For centuries, artists repeatedly portrayed the Blessed Virgin Mary - in whatever form - clad in azure. The imagery was fixed that the blue gowned lady was the Immaculata. At a time when marital unions often resembled business deals more than love matches, this could be make or break marketing - your bridal price has bought one immaculate and utterly divine wife, delivered fully intact, as indicated by the blue gown. Just like the Virgin Mary. Throughout the west, on wedding days, brides accessorize with lucky items. The formula, to bless with good fortune her upcoming nuptials, is laid out in a famous bridal rhyme. It's so familiar that most of us can rattle it off, without once pondering what it all means. But it all becomes clear once you understand what 'blue' represents at a wedding. That line about the sixpence fell out of fashion along with the sixpence, but no-one thought to omit the 'something blue' after Queen Victoria's nice lace messed with that folklore too. This old wedding day rhyme has retained the link between brides and the color blue. It would be lovely to think that truly did refer to her dress. But it's actually the much cruder meaning. Lucky brides go to the altar Virgo Intacta; unlucky ones need to stretch their gowns a little in the hope that nobody notices a tell-tale bump. Modern brides often choose to wear a blue garter to cover the 'something blue'. 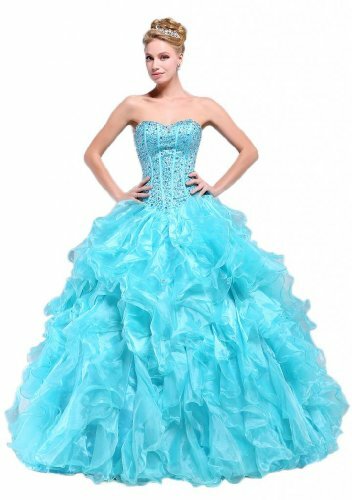 That is itself laden with innuendo concerning the original connotation of bridal azure. It's more allure, when you factor in that it's become traditional for the groom to remove said blue garter, either outside the church or at the reception, waving it aloft as a prize amidst the cheering of his friends. Through his marriage vows, he's just earned the right for his new wife NOT to wear blue. Azure as the color of divinity has a rather older providence in Ireland, than the advent of Mother Mary. 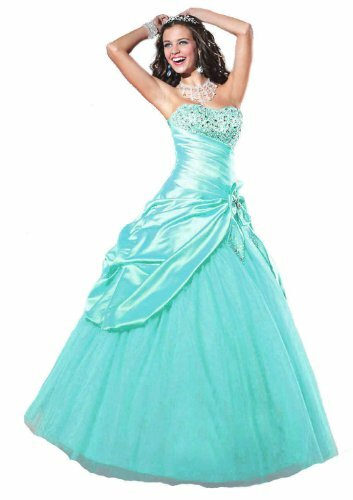 And, until fairly recently, it was customary there to wear blue bridal dresses. Ancient Druidic beliefs still linger in modern Ireland, running like a thread through customs, folklore and the religion that usurped it. This includes the concept of Sovereignty as a Goddess (you may prefer to think of Her as Mother Earth, Mother Nature or Lady Luck). Flaitheas Éireann is the Irish nation - its people, land, culture and spiritual core - in addition to being a deity, and a place. Flaitheas merely means Sovereignty or rule. Her name is Éireann, as reflected in Ireland's official name Eire, and poetic moniker Erin. The Irish literally live in Éireann. 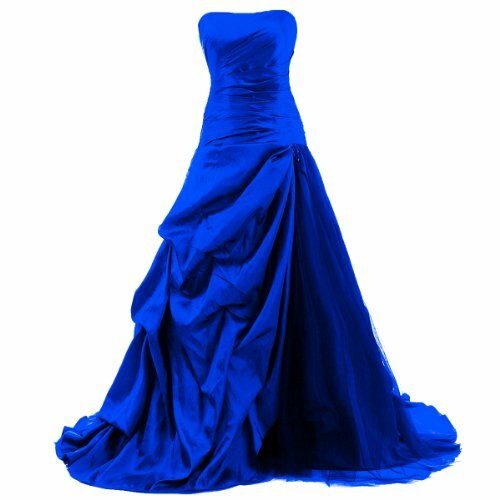 So what's all this got to do with wedding dresses in blue? It might not come as a massive shock to learn that Éireann is generally viewed as a Lady in an azure dress. Today, that exact hue is called St Patrick's Blue, because he had to co-opt it in order to direct belief in Éireann into more Christian channels. In fact, until Irish Americans started messing with the color scheme, Ireland was FAR more imbued with the symbolism of the color blue, than it ever was green. It was the great patriotic Irish hue, because of Her dress, in whose folds they all lived and breathed. She was - and is - the Mother of their nation, and Irish ladies on their wedding days became like mini aspects of Her. The Sovereign of their home; the Mother of their family; the wooed and won Éireann of their marriage. 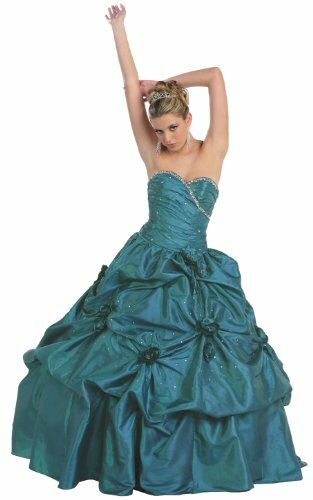 Irish bridal wear was blue not to exhibit virginal passivity, but to show a woman coming into her power! Though, of course, many blue gowned Irish brides probably thought it was all about aping Mother Mary by the time St Patrick's work was done! 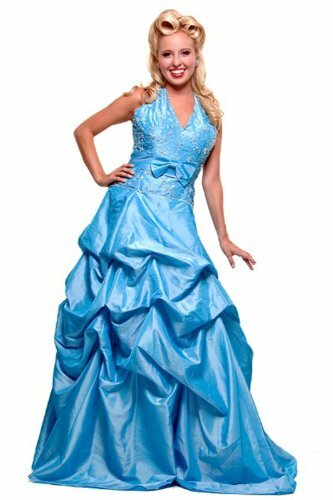 Azure was the color of the Roman Goddess of Love! Every woman on her wedding day wants to be known as the Goddess of Love. 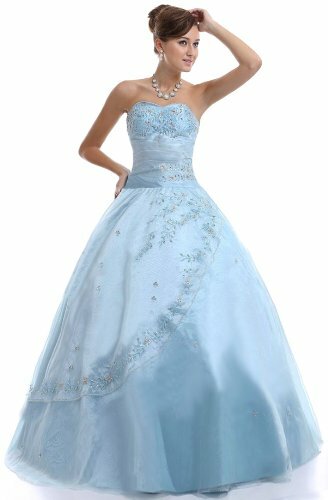 By picking a blue bridal gown, you will look like Her! In the ruins of Pompeii, mosaics and frescos on the wall were saved beneath the ash. They show us Venus, as She appeared around 30 BCE. The embodiment of Love and Beauty was clad in blue! Here She is with Cupid; and again, with the pair of them now joined by Mars and Phobos. 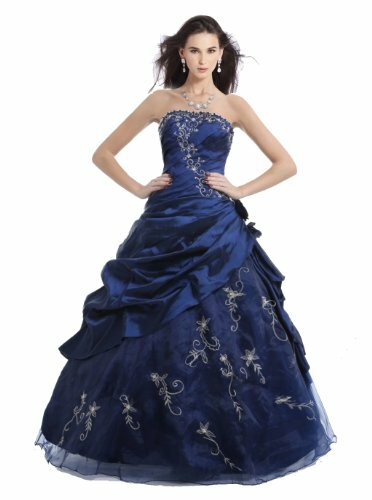 By choosing to mirror her with a wedding gown in blue, you will become the Goddess of Seduction, Enticement, Sexuality and Persuasive Female Charm, as well as the aforementioned Beauty and Love. There was none of this when blue belonged to Mary! But I'm sure that you can work with it too. Did Roman Brides Wear Wedding Dresses Hemmed with Blue? Half of the internet seems to think so, but I've been unable to locate that tidbit in any of my history books. I'll leave this one up to you! 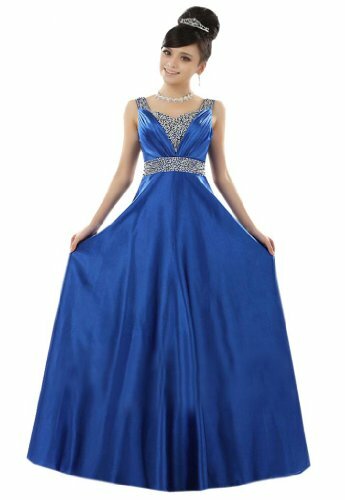 Everywhere I looked on-line, while researching wedding traditions + blue, told me that brides in Ancient Rome included a blue hem on their wedding gown. It was there to symbolize their purity and virginity, and might match the hue of the girdle knotted about their waists. It looked promising. Dozens of websites mentioned it, so it felt like it was probably true. Unfortunately, I'm one of those people who has to double-check everything that I'm told. I hit my books, as I just happened to have several on the Roman period. 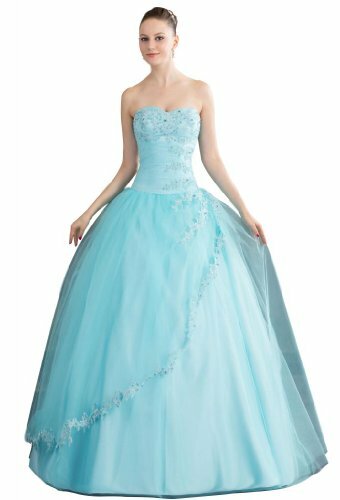 (The joys and perils of being a historian...) But I could locate absolutely nothing about blue-hemmed bridal gowns. What I did find was that the young girls (because they generally were scarily young) generally wore plain dresses with a flame-colored veil. More digging revealed this garment to be a kind of egg-yolk yellow color. Most modern commentators assign white as the Roman bridal gown color, I pictured a yellowish tinge. The girdle was indeed present and correct. Tied tightly in a Herculean knot - or her best approximation - shortly before handing her infant daughter over to the girl's new husband. The knot indicated that no man had yet, ahem, broken in below that waistline. She was innocent and untouched. And that's it! Quite detailed descriptions of Ancient Roman wedding attire and traditions alike, but nothing mentioned blue hems. Nevertheless, I've added it for completion sake, and I can't say that my research was exhaustive, so I may have overlooked the source used by everyone else online. If this one takes your fancy, then there's plenty to choose between here, as is more than aptly demonstrated below. 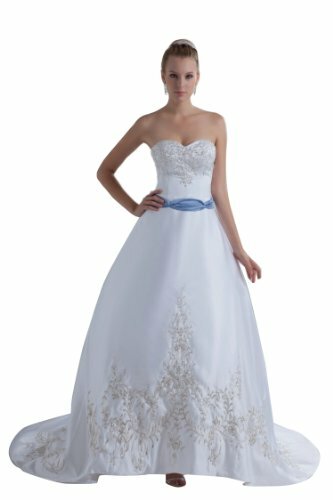 Otherwise, I hope you were able to find something on this page, or at least went away convinced that blue is the way to go for your wedding dress! There's a bit of a Pagan theme, but that's where I've been hanging out until now. I'll add more as my scope expands! Yes, it does. But it's not actually blue, is it? And now you know that Queen Victoria started all of that, just matching up some lace and not leaving the journalists with anything to say! Just shows how such commentators make stuff up to fill column inches. How beautiful. I thought white weddings gowns meant the bride was a virgin (although a long time ago). 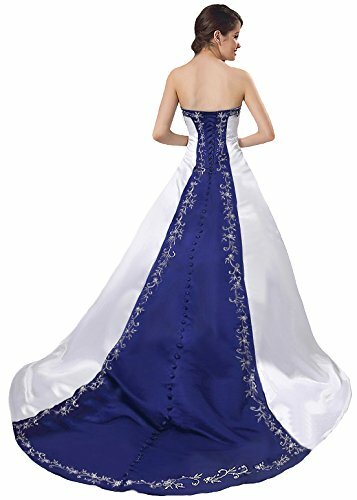 I never knew Amazon had blue wedding gowns. My trouble is, when in the names of all that's holy (and quite a lot that's not) am I ever going to find time to write this all? I'd need to go at LEL's pace. And I don't have staff to wash, iron, cook and clean for me either. Jo, you are a pickle! You just keep feeding me article ideas! I've already had one from you that I'm mulling on. WordChazer - I'd love to read that article! Do it! Do it! 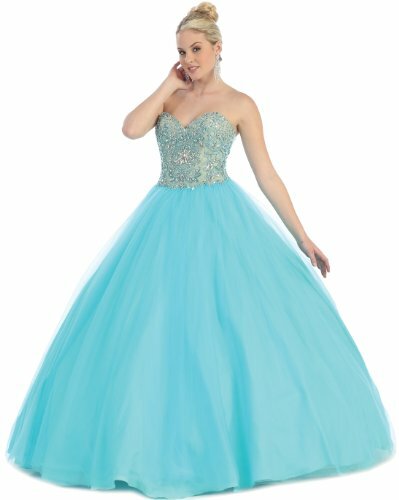 I agree that the blue dresses here look gorgeous. Hi WordChazer, that sounds great! I am always interested to learn about these.